In our busy world today we sometimes don't stop long enough to enjoy the simple things in life. Well I can tell ya electricity is one of those simple things! I have been having problems for a few weeks with half the house loosing electricity off and on and an electrician has been here twice before with the same results. Finally he did find the problem and it was a major one. There was a "leg" also referred to as a "phase" out in the lines. The electric company had to come out and disconnect the power and pull the meter. The electrician forgot a few things and had to run to the shop several times and this caused him to lose track of time and thus caused me to be without electricity for the night. A few weeks ago I had some new neighbors move in and while I don't know them very well I did decide to ask if I could run an extension cord so I could at least plug in the fridge, charge the phones, etc. The woman was very understanding and immediately said she didn't mind at all. I told her I would gladly give her $20 for the electric for the night. She said she didn't want any money and was more than glad to help. I am thinking a box of cards as a thank you is in order for sure! Since we couldn't cook I took the kids out to dinner and then to Walmart for some batteries for one of the camping lanterns. We also stopped at Goodwill and looked around a bit and then buy Autozone for a headlight lamp for the van. After returning home to a dark house we lit some candles and put the batteries in the lantern. Shiane had her Kindle already charged so she spent time reading a book. Chuck was able to get his homework done and then he and I watched a movie. Most nights all three of us are in separate rooms doing our own things but last night was different since we had to be contained to one area of the house and it was nice spending some time with them. I am thinking it might be a nice thing to have the electric go out a few nights a month. It's amazing how we take things for granted so much, especially electricity. It reminded me of a simpler time of when I was growing up and we didn't have cable TV, cell phones, laptops or any other electronic devices and the family spent time together eating dinner and watching TV. It definitely made me think "those were the good ol days". 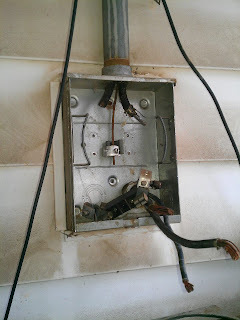 Hopefully the electrician will be here soon and get the problem all resolved and I will be restored to full power. In the meantime I am thankful for having those few hours to spend with the kids just enjoying each other's company. During Hurricane Ike we were without power for 9 days - it sure makes you realize how much you depended on the electricity and that you really can do without it for a while. I hope your power is back up soon, though. Awww, I love how you recognized that good came from bad. You have a kind neighbor and I am sure you will love whatever thank you gift you come up with. I hope you had a new electrician though, since the other one continued to miss the problem. I also remember "the good ol' days" with happy memories. But, then I remember how nice all this new technology is and I'm glad for the progress. I do think we need to slow down a bit and spend more time with the family - so thanks for the "nudge". I love this story. Technology is a wonderful thing - but it also isolates us from each other, so is definitely a double-edged sword. Glad you have such a good neighbor - so few people even know their neighbors anymore. It's good to have someone you can count on in an emergency. I too miss the time when we did not have all the technology. amazing how we take for granted what we have everyday. about 1/3 of michigan lost power last week in the frigid single digit temps. we were without from midnite until 7:30pm the next night. what an experience! glad to see you made good out of a bad situation. imagine what the east coast did for wks w/o power. i wouldn't want that! sure glad your house didn't burn down...good lord! We were wo power for 2 weeks with Sandy. It was ok for the first few days, but after that it was a real burden. There are still those wo power due to Sandy. I agree it's great to unplug for awhile, but power is a wonderful thing. I hope you get your back soon! This is such an "Okie" way of finding the silver lining! Great family time, and a new relationship with your neighbor. And, you have also given us all something to think about! Isn't it amazing what a few nights of no electricity can do for the family unit? Maybe you should entertain the idea of one night a week as family nite or game nite. I too love when we lose electric, only it doesn't happen enough around here! lol It is nice to have all the extra phones, tv's, computers, etc...quiet where you have to actually talk to one another. It's fun to get back to board games instead of electronic games. It's just nice being in the same room together! lol That's why I love camping! But I don't want to give up the electric to the freezer, the blow dryer and many other conviences. lol Still it's nice to be without from time to time. Ok you've been MIA for almost 10 days now....which leads me to ask Work? or Life? You know you are missed. We may not always act like it when you are here but when we don't see you for a while we start worrying. Ok well just checking on you. Miss your "chit"